I learned about PDXWIT when I was new in town and job hunting. Described to me as the best networking group around, I met several cool people, including now a close friend, who not only introduced me to a contact at a consulting company but is in my field. I noticed the energy of the group right away. Informal and welcoming. Well-organized and enthusiastically-staffed, but not fussy, with a focus on the critical issue of getting more women into the tech field and breaking down barriers. Also impressive is the number of men at these events, which I had not initially expected, making the cause feel supported. The support from the business community is striking, including the firms hosting the venues and making presentations about their progress in inclusion. I signed up for as many events as I could. I enjoy the town halls with the leaders of our state including the Mayor and Congresswoman. The focus on entrepreneurship and getting started is helpful; the group is full of fantastic advice. I am especially impressed by the Women of Color in Tech and have been attending all of those events. The fact that PDXWIT is an environment that encourages this grassroots community is heartwarming. Moving from a much more diverse city, I missed that part of my old community. I also know more effort is needed in Portland to improve the environment not only for women but especially for Women of Color, and I am eager to do my part. Recently, I interacted with one of the PDXWIT board members. We joked that we were among the older in the crowd, and we connected right away. I asked her about the strategic direction of PDXWIT and learned that they were at a pivotal point in their growth— hiring an executive director and considering the path forward that would harness the energy and momentum. With my new friend, we offered to do some pro-bono work for PDXWIT, since strategic planning consulting was in both of our wheelhouses. What a great experience to meet with other volunteer leaders of PDXWIT and share their vision and enthusiasm for the future. I am excited that I’ve been able to contribute my skills to the ongoing success of such a wonderful organization. My first event was at Free Geek, where I had been volunteering learning laptop refurbishment. That first event was fantastic, and I can remember being so impressed by all the women. Though new to tech, I have been working in science since college and being outnumbered by male colleagues in professional environments is familiar. It's been so refreshing to interact with so many talented women with unique voices and to be part of such a compelling and growing organization. How did your participation at PDXWIT events help you in your career path? At one of the spring events, I noticed one of the men I hadn’t talked to before. I am very curious about what brings men to these events—part of my interest in strategic planning—so I introduced myself. Barry said he was recruiting, I said my specialty was the Human Side of Change, and he said “like this?” pointing to his recruiting flyer. From there we connected on LinkedIn and I applied to KinderCare Education (KCE). I was vaguely aware before meeting Barry that KCE’s main offices were in Portland, but I hadn’t explored opportunities yet. So, PDXWIT introduced me to a firm that both needed my skills and aligned perfectly with my values and interests in children. 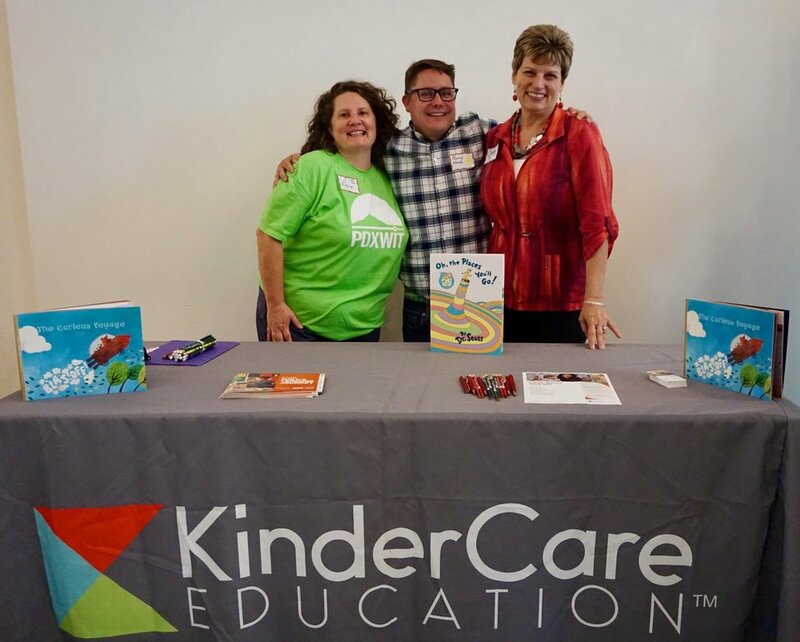 I met Barry and Natalie from KinderCare at one of the PDXWIT Happy Hour events. The discussion resonated with me, so I kept an eye out for openings. As my career has varied, including marine research, my background and skills on paper may not indicate a precise match in a technical field. I was glad for the opportunity the night before a phone interview to have another chance to touch base with Barry at a PDXWIT event, to put a face with a name and convey strengths that a mere resume cannot or that could be missed over a phone line. Though still very new to Kindercare, I feel at home already and excited by the opportunities that lie ahead. Also, I was able to cross one goal off my list and that was the ability to bike to work. So happy to have a relatively easy commute and thankful to have found such a supportive and inspiring community! KinderCare has great career opportunities for dedicated, responsible and creative professionals. They offer competitive salary and benefits, and a friendly and creative atmosphere where you can be part of a team of caring, skilled professionals. Learn more and view current openings.